Much like humans, diabetes in dogs is on the rise. The University of Illinois College of Veterinary Medicine recently reported a 32% increase in canine cases from 2007 to 2012. While the warning signs may be present in a dog, they often go undetected for a year or more. 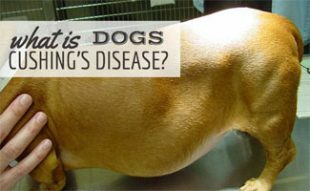 This story can hopefully provide some insights into how to detect diabetes in dogs and how to treat it, if these alarming statistics befall your pet. 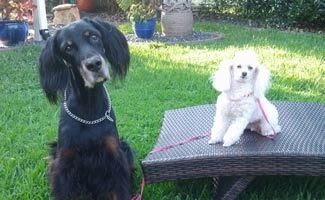 Gunner, a Gordon Setter in his eleventh year (the black dog pictured below on the left), lies quietly under a chair in the examining room at the Florida Veterinary League in Vero Beach. Dr. Francisco Torrado explains to Gunner’s owner how to test Gunner’s blood glucose so an appropriate dose of twice-daily insulin can be prescribed. “When we hear the dog is drinking more water, has increased hunger but still seems to be losing weight, we want to check for diabetes with a blood and urine sample”, Dr. Torrado explains. “Glucose is one of the essential nutrients needed by the body but sometimes absorption is a problem. Cells cannot absorb the glucose being produced, so it gets dumped into the urine and the blood all at once. 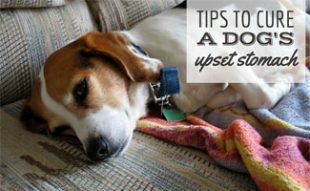 When we see high levels in the blood, we suspect diabetes as the number 1 culprit.” He advises getting a urine test strip to check for ketones in the dog’s urine. Very high sugar levels is called Hyperglycemia. In contrast, Hypoglycemia occurs when the glucose, or blood sugar, is too low. Signs include sluggishness, lack of coordination, lethargy and confusion. These indicate the need to step in immediately with a spoonful of honey or Karo syrup to bring levels back up. 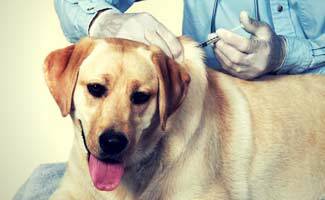 Both Hypoglycemia and Hyperglycemia require blood glucose testing to find out each dog’s correct insulin dose. I gained some experience with the testing procedure when helping to make the ‘curve’ chart for Gunner. This involves getting a blood glucose reading at intervals throughout the day. Gunner was tested prior to his first insulin shot of the day and before he eats breakfast. The second test was 30 minutes or so after his insulin shot and his meal, which are given simultaneously. Another test mid-morning, midday, then another before his dinner and shot (ideally 11 to 12 hours after his first shot of insulin and breakfast), then another test 30 minutes after his dinner and insulin shot. Dr. Torrado explains that in treating diabetes with insulin, the goal to level out the high and low reading so the ’curve’ chart looks gentle and does not show big hills and valleys. Once treatment starts, the dog would not have drastic changes in his blood sugar levels throughout the day. The test kit looks just like one for people, but calibrated to dogs. We prick Gunner in the elbow callous, a popular testing site that has enough capillary blood to enable testing. We then slip the test strip under the tiny blood drop that appears and the signal beep from the test unit tells us we have a reading. The testing procedure is really a 2 person job, since someone needs to keep the dog calm and find the blood dot while the other person inserts the test strip into the meter. This proves more challenging than actually giving the insulin shots. Based on all the readings throughout the day, it is determined that Gunner’s blood sugar numbers are high, in the 380 to 480 range making him lean toward Hyperglycemia, and so his insulin dose is increased very slightly. 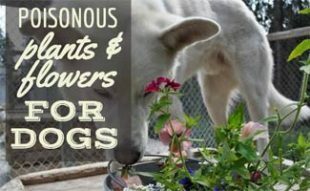 Although his numbers would ideally fall between 100 and 200, no two dogs are alike and the levels tolerated by one would send another into renal failure. Testing the blood sugar at the outset of diagnosis is the best way to customize treatment. We can help keep dogs healthy by maintaining a good weight and not feeding ‘people’ food. Watch the treats you feed, too; many are high in sugar. 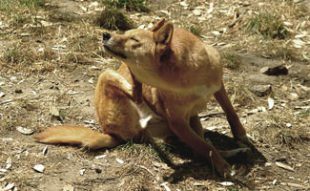 Be sure your dog is getting ample exercise and yearly checkups; twice yearly for senior dogs. If your dog is diagnosed with diabetes, help is on the way. Once the blood sugar testing curve is completed and a proper dose of insulin prescribed, shots can be easily administered by almost anyone. Prescription dog food that is low in fat is another weapon to fight the disease. Gunner is feeling frisky again since his last insulin dose adjustment brought his blood sugar numbers down and his owner tells me he is back to running squirrels out of the yard. My Min Pin has been diagnosed with Pancreatitis. He was in the hospital for 11 days. 24 hour IV’s. Did not eat for several days. Took 2 blood and urine samples and they were sent in, after the 2nd set of tests, they told me that he does not have diabetes. Then he had a 2nd test and they told me he has diabetes. That day, without knowing about the blood and urine test, he was eating some apples. So I don’t know if that caused his high sugar level. I have to feed him Hills Science ID dry dog food. They showed me how to give him his insulin shots. He still drinks a lot, but he always did when I found him. He is so hungry, I was told to feed him his dog food in the morning 1/2 cup, and in the afternoon I have to feed him plain cooked chicken and vegetable, like peas, broccoli and green beans, and give him carrots for a treat. Which I have been doing, then he gets 1/2 cup of his dry dog food at night. I do not give him anything that he is not to have. He was also given B12 shots. He is very active and runs all over the place, pulls me while walking. But as I said he still drinks a lot and is very hungry when I feed him. They want me to get another blood test, but I still owe them money and don’t have the money to pay for this test. In March, when I take them for their shots, I go to the Animal Cruelty Center and it costs a lot less plus I get a discount because I am disability and retired. I am going to have another blood test on him to check his blood sugar. I would also like to know if he can have a rawhide bone? Or a dog treat that I make them myself, no sugar, no vanilla just wheat flour, yellow corn meal, 1 egg, water and I use Olive Oil. I would appreciate anything you can help me with. Hi Patti, I think if what you are doing is what your vet told you to do then you’re doing the right thing. Your vet knows your situation best. If he ate more before this new regimine it makes sense that he’s always hungry. (It’s like when we go on diets and we’re starving because we’re being more strict with our snacking and portion sizes.) Before giving your dog a treat or rawhide I would talk to your vet and check out the article below. Hi Kimberly, does a dog have to fast before taking a blood test? Because he ate some pieces of apples before the 3rd test. Great question Patti. Different blood tests are treated differently. Some require what they call a “gentle fasting” which is when you do not feed your pet for about 6 hours before his/her appointment. However, each blood test can vary. I suggest calling your vet if you think the results may be skewed.